play, criticality, access | Abler. 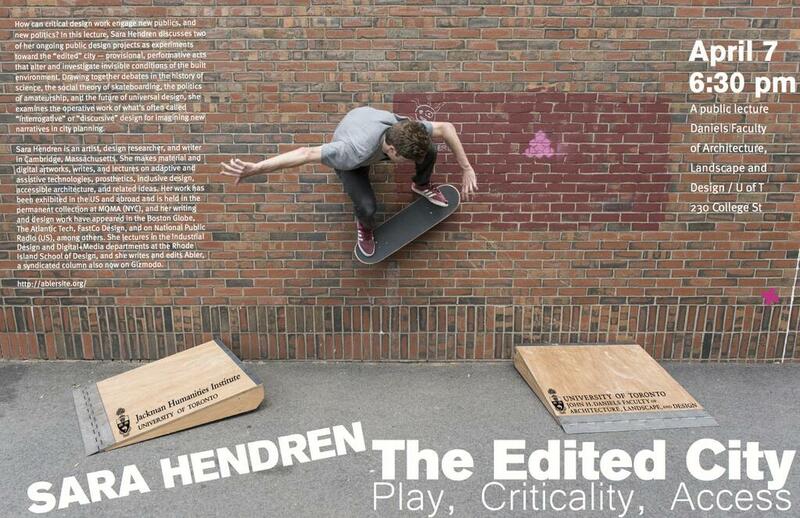 I’ll be at the University of Toronto next Monday night, speaking on The Edited City: Criticality, Access, Play. The history of science, skateboarding culture, the politics of amateurship, and the future of universal design. I’d love to see you there! I’m also looking forward to visits with Ryerson’s EDGE Lab and OCAD’s Inclusive Design Research Centre. The lecture is on April 7 at 6:30 pm, Daniels Faculty of Architecture, Landscape, and Design at the University of Toronto, 230 College Street. Text on the poster: How can critical design work engage new publics, and new politics? In this lecture, Sara Hendren discusses two of her ongoing public design projects as experiments toward the “edited” city—provisional, performative acts that alter and investigate invisible conditions of the built environment. Drawing together debates in the history of science, the social theory of skateboarding, the politics of amateurship, and the future of universal design, she examines the operative work of what’s often called “interrogative” or “discursive” design for imagining new narratives in city planning.